Brian Kokes is the guy, and he called this process "Project Longhaul." 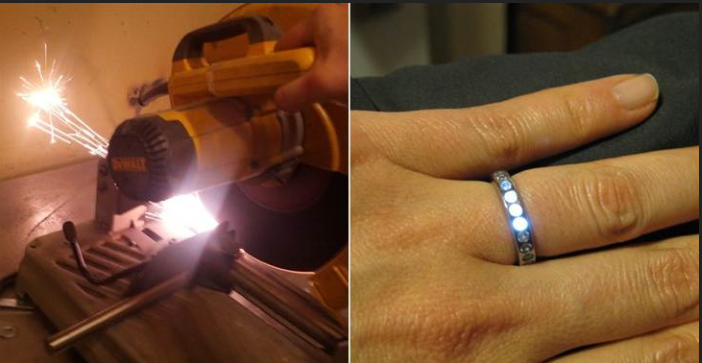 When Brian met the girl of his dreams, he started thinking about proposing, and came up with the idea of designing a ring which would light up when he was really close, 4 inches away to be exact. He has all the stones, backlit with really tiny LED lights which are powered by a copper coil that is in the titanium ring. The copper coil generates energy when it is exposed to an alternating magnetic field. Kokes wears a device on his wrist which supplies that alternate magnetic field.